I can't believe September is here! The weather is amazing! You can feel it in the air...the humidity is gone and Fall is coming (GOT fans??). Yes, we still have warm days ahead, but those are the beautiful, delightful, can't-stand-to-be-inside type of days! This is when our porch gets the most use. We make drinks and snacks, Ryan pulls out his golf club and practice balls, I open a book or magazine and we just sit outside enjoying the comfortable weather. 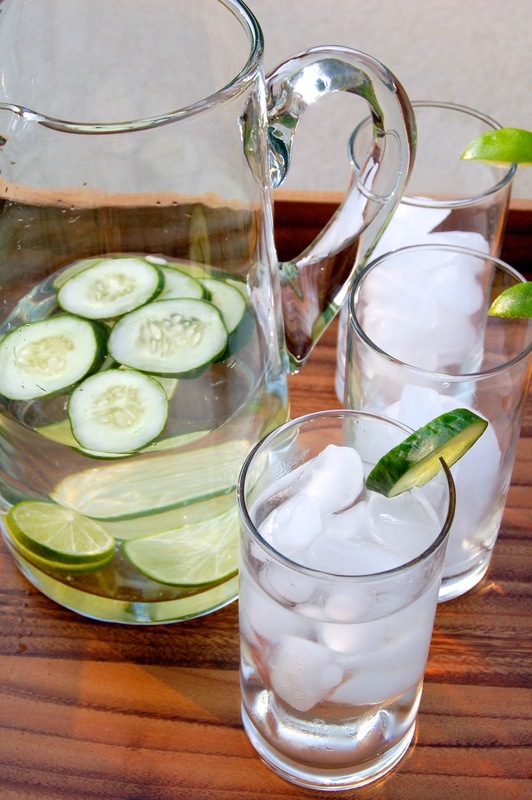 The perfect thing for porch-sitting-September evenings is fresh flavored waters. Flavored water is the perfect beverage for those "Ahh, this feels nice" kind of days. If you are feeling a little spunky, add some vodka too! Cucumber alone - feels like you are at the spa! Combine the ingredients and chill in the refrigerator for 30 minutes before serving. Football season is here! Check back early next week for the best baby back rib recipe you will ever come across. Thank you for the special birthday recognition. That sentiment goes both ways! Ryan was blessed when you accepted his marriage proposal. I was blessed to gain a daughter.